Canadian Thanksgiving! | bake me away! I’m not Canadian. However, while on my trip to New Zealand, most people guessed that I was from there, mainly because I didn’t seem American? I am super quiet, not that Canadians are stereotypically quiet, but I guess Americans have a reputation for being on the loud side… Those who did guess that I was from the US often assumed California, but never Texas (“Where’s your accent??”). It quickly became a fun game for me when people asked! 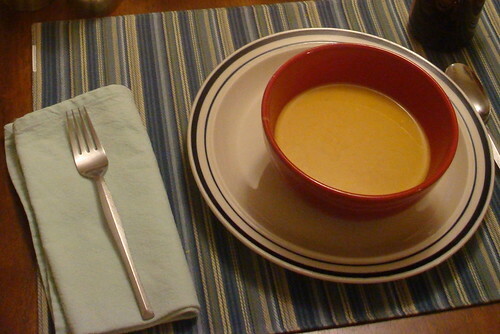 Julie made a squash soup that was the perfect combination sweet and spicy! I definitely need to get the recipe from her. It was very smooth and a great fall-like start to our meal! Andrew baked no-knead bread, which I had evidently never seen before. At first I thought it was a cheesecake! 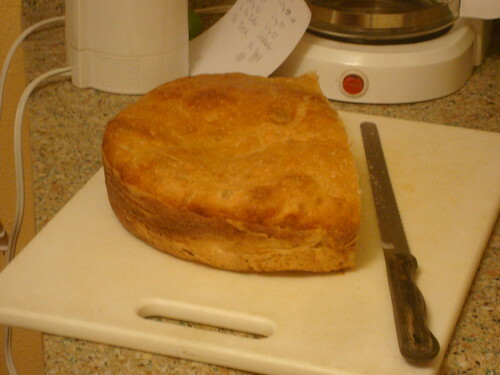 He said it is left to rise in a pot for 18 hours and is then baked in the same pot, which is how it gets its shape. The inside is very moist, chewy and unlike any bread I’d ever had! I’d like to try baking it sometime. I put together a salad, which was tough work, let me tell you… There’s a salad mix at our grocery store that is a combination of arugula, spinach, and herbs (cilantro and dill). 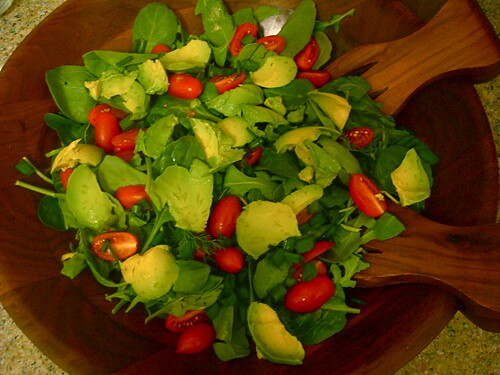 To that, I added green onion, cherub tomatoes, and avocado, then mixed up a dressing of olive oil, Dijon mustard, red wine vinegar, garlic, and salt and pepper. Will definitely make it again! 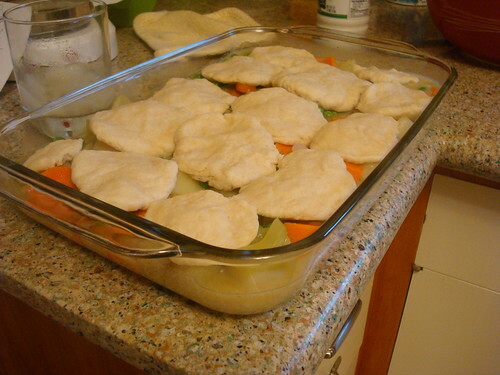 For the main dish, Jill made a vegetable pot pie! There were potatoes, carrots, celery, onions, and peas in it, and she topped it off with homemade buttermilk biscuits. Yum! 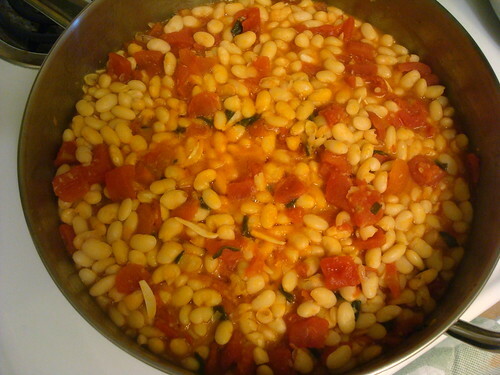 She also made these very flavorful white beans with tomatoes and garlic. Hooray for protein! I had both the pot pie and beans for leftovers today, which made my tummy very happy! 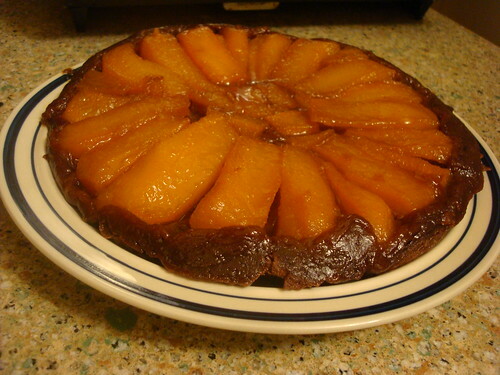 For dessert, I made my first tarte tatin! The puff pastry isn’t burned, by the way…being the way that I am, I had to go and weird things up. ;) I’ll post more about it tomorrow, including the recipe! Happy Belated Thanksgiving, people of Canadia! Thanks for giving us a reason to make things and share them with friends. :) And of course, thanks for hosting, Jill! Hooray! Isn’t the salad so pretty? The meal was so bland looking until you brought it out. Well, we are both fond of the color green… It couldn’t have been a meal without your dishes! What a feast–I love it! I’m super excited to see your tarte recipe…and if you happen to get the recipes for the squash soup and no-knead bread, I would love to try those, too. 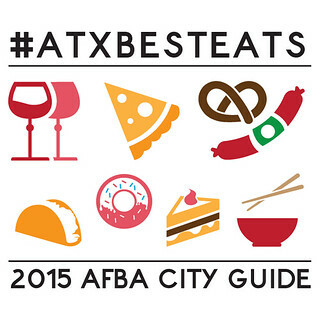 I’ve never seen a recipe for no-knead bread, but I definitely like the sound of it! And you must try tempeh if you get a chance! Just slice it, lightly brown it with some olive oil in a skillet, and go crazy! I’d try a sloppy joe recipe first maybe? It gives the filling a great meat-substitute texture. 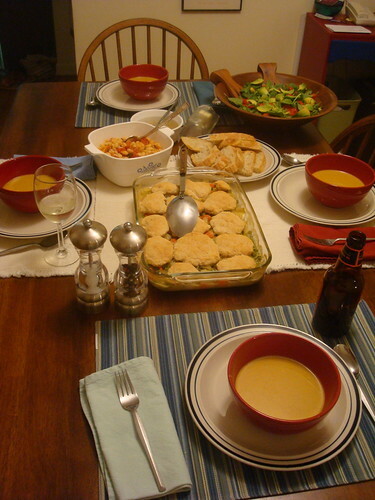 Thanks for sharing about your Canadian T-Day feast–looked wonderful! 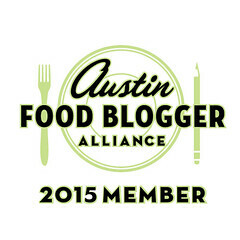 Ironically, they’ve just posted about no-knead bread (with recipe) at KAF today! http://www.kingarthurflour.com/blog/2010/10/13/can-you-beat-this-whole-grain-bread-you-bet-its-no-knead/ The basic preparation sounds similar to Andrew’s, but his reminded me of sourdough. Will see about recipes! everything looks so yummy! great job and thank you for sharing. Pingback: Ginger and Vanilla Pear Tarte Tatin with Chocolate Puff Pastry | bake me away! Pingback: Pie: You win some, you lose some…or both. | bake me away! When you convert a recipe to grams so that you can divide it by three (to make one) and it turns out perfectly the first time, it’s probably a pretty solid one. 🥞 Pancake success from Gabrielle Hamilton’s Prune cookbook!